Tom Petty and the Heartbreakers changed colors like chameleons Sunday night at the Marcus Amphitheater. They turned into a bar band and played songs by Elvis, the Animals, the Clash and the Georgia Satellites. Blink again, and they changed into a blues band, a jazz ensemble, a bluegrass outfit, even ragtime revivalists. They drew the line at rap. But the show was a startling statement of diversity. 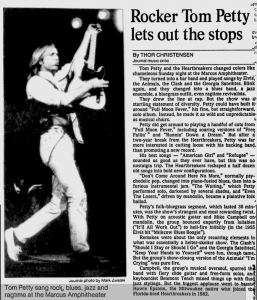 Petty could have built it around "Full Moon Fever," his fine, but straightforward, solo album. Instead, he made it as wild and unpredictable as musical chairs. Petty did get around to playing a handful of cuts from "Full Moon Fever," including soaring versions of "Free Fallin'" and "Runnin' Down a Dream." But after a two-year break from the Heartbreakers, Petty was far more interested in cutting loose with his backing band than promoting a new record. His best songs -- "American Girl" and "Refugee" -- sounded as good as they ever have, but this was no nostalgia trip. The Heartbreakers reshaped a half dozen old songs into bold new configurations. "Don't Come Around Here No More," normally psychedelic pop, changed into piano-fueled blues, then into a furious instrumental jam. "The Waiting," which Petty performed solo, darkened by several shades, and "Even the Losers," driven by mandolin, became a plaintive folk ballad. Petty's folk-bluegrass segment, which lasted 30 minutes, was the show's strangest and most rewarding twist. With Petty on acoustic guitar and Mike Campbell on mandolin, the group bounced expertly from lullabies ("It'll All Work Out") to hell-fire hillbilly (in the 1955 Elvis hit "Milkcow Blues Boogie"). Remakes were about the only recurring element in what was essentially a helter-skelter show. The Clash's "Should I Stay or Should I Go" and the Georgia Satellites' "Keep Your Hands to Yourself" were fun, though tame. But the group's show-closing version of the Animals "I'm Crying" was pure fire. Campbell, the group's musical oversoul, spurred the band with fiery slide guitar and free-form solos, and keyboardist Benmont Tench mixed things up with fluid jazz stylings. But the biggest applause went to bassist Howie Epstein, the Milwaukee native who joined the Florida-bred Heartbreakers in 1982.